I think we have two problems in <?xml:namespace prefix = st1 ns = "urn:schemas-microsoft-com:office:smarttags" />Kenya; the first is a political and legal problem occasioned by a stolen election. The second is a law-and-order issue. The election results declared over a month ago by the Electoral Commission for Kenya (ECK) chairman, Samuel Kivuitu, may or may not reflect the will of the Kenyan people. That uncertainty is at the heart of the current political crisis and needs to be cleared up. The only way is through a recount and re-tallying of the votes. Well, not too long ago, in an exceedingly rare demonstration of honesty, Kenya's Attorney-General Amos Wako went against his boss, President Mwai Kibaki, and recommended a recount and further declared in his statement that we do not need a court order to do that. This statement stands in marked contrast to the claim by the Justice and Constitutional Affairs Minister Martha Karua that a recount can only be ordered by the courts. In my view, since Wako holds a constitutional office and Karua is a (possibly invalid) political appointee, his word carries much more weight than hers. The issue is further complicated by Raila Odinga's and the ODM's refusal to go court citing the fact that the judges have been appointed by Kibaki himself and thus questioning their neutrality. I consider Raila's rejection of the court system to be hypocritical. He cannot pick and choose which parts of the constitution he wishes to obey. He cannot rely on certain provisions which back his case for the Presidency and reject those that complicate it. Our judges have always been appointed by the sitting President. The fact of their appointment is not enough to impugn their integrity. 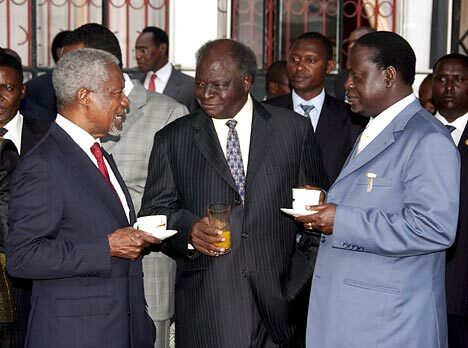 That said, it is manifestly unfair and self-serving for Kibaki to insist on this course of action considering that our courts take up to five years to dispose of election disputes (Kibaki's own case against Moi's 1997 election was decided in July 1999, after almost one-and-a-half years) and the overall politicization of the court process. The earlier mentioned case of Kibaki was thrown out on the basis that President Moi was not personally served with the petition despite the fact that (as reported by Kenyan Jurist) all the previous decisions, both local and from other commonwealth countries, with similar legislation, were clear that the petitioner had several options of service of the petition including service through the Kenya Gazette; and despite the judges acknowledging the factual accuracy of Kibaki's claim that presidential security consistently had denied him personal access to Moi. Kenneth Matiba's court challenge of Moi's 1992 election was similarly thrown out on the flimsy grounds that the petition was not signed by Hon Matiba himself but his advocate. On such technical decisions were Kenyans were denied the right to know what actually happened. Though the results of any public re-tallying by an independent body (as recommended by Wako) would not automatically overturn the ECK's decision (only a court can do that), they could then form part of the evidence in a subsequent petition and the public pressure would probably insure against any shenanigans by the judges. Also, Parliament, when it convenes, should urgently consider changes to our laws to place limits on how long courts can take to rule on election petitions, and to govern the inauguration of a new President to allow time for the petitions to be heard and determined. As for the law-and-order issue, no political protest (of whatever magnitude) justifies ethnic cleansing, murder and looting. What we have in the Rift Valley and other parts of Kenya are thieves and killers masquerading as political protesters. I think the government should clamp down on that nonsense mercilessly (by for example immediately arresting and charging all those culprits who have been committing these acts in the full glare of TV cameras) while at the same time allowing space for legitimate and peaceful protest. It is sadly ironic that the very clique that used mass action so effectively against Moi in the 1990s is now banning that very tactic. We have truly come full circle. The scenes of peaceful women demonstrators being dispersed with teargas when they were clearly posing no threats to the peace are deplorable (a caveat here: They really should have informed the Police of their intended march; we cannot uphold the law by abusing it). The called for mass action should be allowed to take place and the organisers should cooperate with police to ensure no violence occurs. That way, the police will truly be seen to be serving the Kenyan nation and not securing the interests of a would-be dictator holed up in State House.